A team from Ramsey Grammar School have won the Boston Group Award for Student Company of the Year 2018 as part of the Junior Achievement Company Programme. 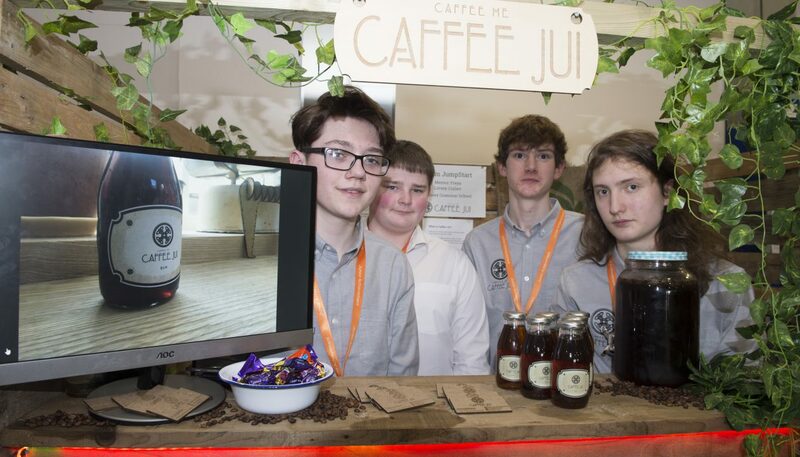 Jumpstart – Phin Jones, Fergus Lole, Matthew Moore and Torry Wade – took the title with their Caffee Jui product, a cold brew coffee that uses natural Manx ingredient, hailed ‘outstanding’ by the judging panel. 23 student companies from Ballakermeen High School, Castle Rushen High School, Queen Elizabeth II High School, Ramsey Grammar School and St Ninian’s High School competed in Junior Achievement’s Company Programme, sponsored for the seventh successive year by the Boston Charitable Foundation. The Company Programme tasks Year 12 students to form and run a company, then take their product or service to market over the course of one academic year. Company of the Year runners-up were Motus from Queen Elizabeth II High School for their environmentally friendly water carton. Third place went to Flux, also from Queen Elizabeth II High School, for their Affinity charger. The awards were presented at a ceremony held at the Villa Marina, sponsored by Canada Life International, where the audience heard Junior Achievement’s chief executive Sue Cook explain that the JA Company Programme was the world’s largest entrepreneurial programme for young people aged between 15 and 19 and that to take part could be ‘life-changing’. Presenting Jumpstart with the Company of the Year trophy, the Boston Group’s Erica Bellhouse spoke of the ‘wealth of talent’ the competition had revealed and that the team ‘stood out for their knowledge of their business’ and that their passion for their product was ‘outstanding’. Jumpstart’s managing director Matthew Moore said: ‘The team really came together well. Phinn and Fergus were the practical ones, Torry was great at marketing and as MD, I’m the perfectionist who wants everything to be just right. What was invaluable was having Freya Livsey-Corlett from the Stars Group as our mentor; she gave us room to grow and helped to bring out our complementary skills. Jumpstart will go on to represent the Isle of Man in the JA Europe Company of the Year competition in Belgrade, Serbia in July. To find out more about Junior Achievement, the Company Programme visit jaiom.im, contact Sue Cook, 666266, sue.cook@jaiom.im or follow juniorachievementisleofman on Facebook.